This book and the book series is very intense and it is very fun to read and I can’t my eyes off of it had a lot of action in it and bad things that happen such as people dying. 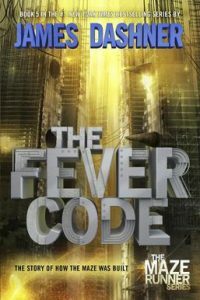 This is in a series of 3 other books and this book takes place Tomas and his friends went in the maze.The Fever Code takes place before “The Maze Runner” occurred and also written by James Dashner. This book takes you back to when two mazes were being built for the “Maze Trials”. The maze trials is a challenging like game and there mission is to leave but the maze has a lot with challenging moments ahead like grievers and the people that are outside of the maze. This book is the last book of three other books that are in the series. The Fever Code is about how the maze was built. The main characters of the story are Thomas, Teresa, Alby, Minho, Newt, Rachel, and Aris. The Fever Code takes place underground, the kids are immune to the flare except for Newt. And the “The Flare “ is what they call the virus. So the kids and Wicked, is trying to find the cure with kids are also going to help do it. Also Thomas and Teresa can talk to each other in their minds. Wicked is the organization which made “The Flare” , a deadly disease that make people go insane. The disease they made was for lowering the population because there were too many people in the world. But they messed up so Wicked found kids that were immune so they had to find a cure for the disease. So then they could have a fresh start because there was not enough food to give to everyone in the world. Wicked thought of making a virus for the population to go down but they messed up. So Wicked made the “Maze Trials”, all the kids that were immune had to go in the maze but first they had their memories wiped so no one knew each other when they went in the maze and had to find a way out of the maze. Also , one of the challenging things were that there were the grievers which were very bad and they lived in the maze and are made out of machinery the government made. They are made out of slime and metal and have deadly weapons and they have to go past them to leave the maze. In The Fever Code a group of kids are trying to find out about what cranks are and they have to deal with them before they go into the maze. Cranks are the people that are infected with the “The Flare”. After that they have to have their memories wiped then they go in the maze which is the first trial. Then it is the “Scorch Trials” and they have to go through a city full of cranks, before that they have to travel through the flat trans which is like a desert. The book was very interesting and was exciting, shocking, and plenty of violent death. The book series is very fun to read and has plenty of action in it and survival. You would have to start at the first book to the last book in order or it would not make any sense at all. Also the genres are young adult fiction, science fiction, and Utopian and dystopian fiction.